The final day of the Longines Global Champions Tour of Mexico City was a scorcher in all senses of the word, paving the way for second leg of the 2018 Championship race. Following an electric curtain raiser in the heart of Mexico’s capital city, the LGCT and GCL series now look to the magnificent destination of Miami Beach, where the world’s top horses and riders will battle for supremacy just metres from the Atlantic ocean. 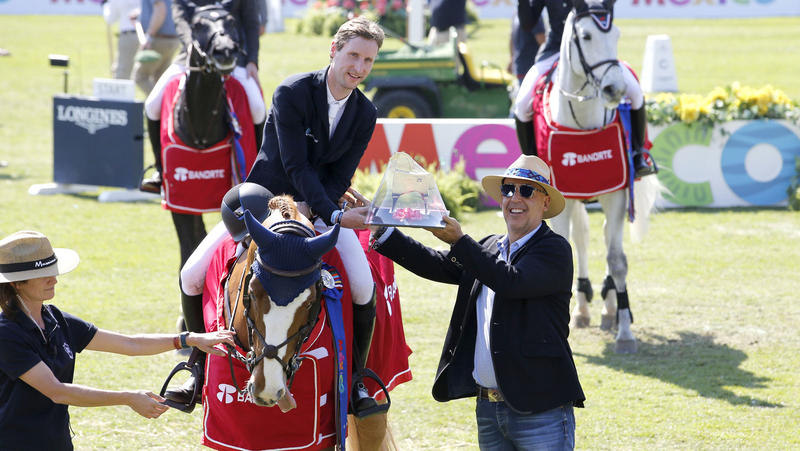 The weekend saw two-time Tour champion Scott Brash prove once again why he is one of the best and most respected riders in the world, securing a dramatic victory in Saturday’s LGCT Grand Prix with his superstar 17-year-old mare Ursula XII. The British rider leads the overall rankings at this early stage but a historic third championship title looks a tempting target for Brash has he follows the Tour this year. GCL team Miami Celtics will be hoping it’s a home advantage for their team as they head to leg two of the 16-event series, with another strong result setting them up well on their quest for a place in the GC Prague Play Offs. With every day on the Longines Global Champions Tour of Mexico City providing world-class sport and spell-binding action, the stakes were raised once again for the big-money concluding 1.55m jump-off class. In a turbo-charged display of horsepower it was Pieter Devos of Belgium who landed a momentous win, just gaining the advantage over Italy’s Lorenzo De Luca and third placed Denis Lynch (IRL). Sunday’s track was set as a serious test with plenty of jumping efforts, but inviting fences and encouraging lines did little to deter these talented horses and this elite field of 41 riders made the course look relatively comfortable. Clear rounds came thick and fast but as the faultless rounds racked up to a grand total of 16, a mouthwatering prospect of yet another edge-of-the-seat jump-off unfurled. “It’s hot today and the horses have already jumped a lot this week so it’s good for the horses’ confidence that they can jump a nice track today,” said Devos after his first round clear. “I have a fast horse but this is his first outdoor show so I have to keep that in mind, but I think I can go for it in the jump-off,” he added, with incredible foresight. In a truly cosmopolitan field, three riders came through for Italy, two for Ireland and Belgium, and from destinations as the Czech Republic and Sweden. The packed stands and VIP hospitality area sizzled in anticipation as the first rider entered the vast arena deep in the heart of this vibrant city. Pathfinder Lorenzo De Luca (ITA) and the gallant Limestone Grey would have been one of the favourites to win this valuable prize and, first away, he pivoted round the tightest of turns and allowed the 12-year-old gelding to open up down the lines. They skipped through the airy double before soaring down over the final oxer for a masterful clear in 36.35s. The Italian speed merchant had set a serious target. But Miami Celtics GCL hero Denis Lynch (IRL) always loves a challenge and he powered out of the starting blocks on RMF Echo. Pushing and encouraging all the way, the pair scooted down the final line just a fraction outside the Italian’s time in 36.41s. Kevin Staut (FRA) and Viva de Malica hit three rails before Jerome Guery (BEL) riding Kel’star du Vingt Ponts produced a solid but steadier clear in 37.79s. There was no chance of the pace slacking as Roger-Yves Bost prepared to stake his claim with Sunshine Du Phare, but an early oxer fell for the Frenchman. Expectations were sky high as the unmistakable figure of Marcus Ehning (GER) and Cristy entered the ring, but hopes were soon dashed as the slightest touch at the front rail of the Massimo Dutti oxer gave them a four-fault score before Alberto Zorzi (ITA) and Fair Light van T Heike made the same mistake. Catapaulting out of the starting blocks, Pieter Devos (BEL) and the very careful white-faced chestnut Apart spun round the corners and soared straight to the top spot in 35.65s. Next in was the previous day’s LGCT Grand Prix champion Scott Brash (GBR), who rode a smooth round on the up-and-coming Hello Shelby, just tapping out a rail on the final oxer. With four contenders left to go, the pressure was immense. But when the faults came for Darragh Kenny (IRL) and Cassini Z, then Anna Kellnerova (CZE) and Calcourt Falklund, followed by Maikel van der Vleuten (NED) on Idi Utopia and Christian Rhomberg (AUT) with Saphyr des Lacs opted for a steady clear, it was time for Devos and his team to start some well deserved celebrations. “The turn to the double was really difficult and you really needed a horse with a lot of experience, so I’m just happy my horse did what I wanted,” said Devos. That concludes a top notch opening show for the 2018 Longines Global Champions Tour and GCL in Mexico City. The Championships now move on to the breathtaking destination Miami Beach in Florida (5-7 April) where the high drama looks set to continue as two-time Champion Scott Brash (GBR) will look to defend his narrow Ranking lead against the world’s very best horses and riders.